If the entire world is buying smartphones and cell phones with cameras, why are we worried about separate cameras or even flatbed scanners at all? Can't we just take a photograph of our documents with our phone and leave it at that. Why bother with a bulky, less-than-portable, scanner? If scanners are needed, why do the FamilySearch Document Acquisition people use cameras? Why have cameras been used for archiving since about 1938? Why don't they just scan the documents? The answers to all these questions involve complex issues, some practical, some economical, and some chiefly political in nature. The answers also involve the evolution of technology and the rate at which technological changes are adopted by archivists and document conservators. To start this particular discussion, I need to show three images. One, obtained by a camera and then developed as a microfilm image and subsequently digitized, the second, an image altered by modern image enhancement techniques, and the third taken by a modern digital camera directly from a document. Before presenting the three examples, I need to explain what you are going to see. Document reproduction (and all photographic processes) depend on the quality of the physical document. Old documents are seldom in pristine condition and are subject to a variety of natural forces that may destroy the original documents and make them unreadable: fires, floods, mold, insects, chemical changes, rough handling, and many more. Original reflective light photography could do very little to improve the readability of the original document. Microfilm images were often unreadable. The advent of digital imagery and the technology involved has developed ways to restore unreadable images and even reveal images that are invisible to the naked eye. But much of this image enhancement technology depends on access to the original documents. There is only so much that can be done to enhance a poor microfilm image of an unreadable document. In addition, if the original document is unreadable, there are both temporal and economic issues the arise if document restoration techniques are to be used. More about this later on in this post and the series. Again, you may need to click on the document to see the detail. 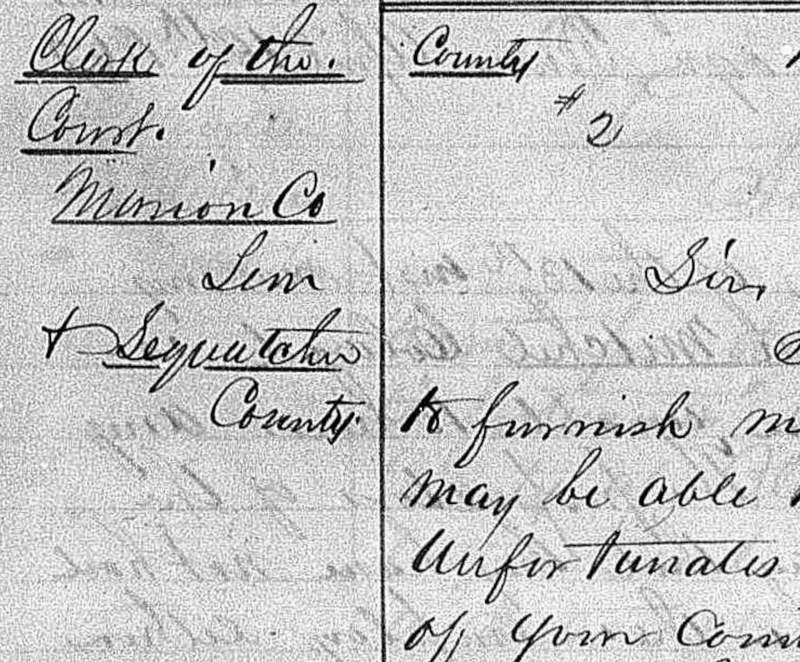 You might not be able to tell, but the second image, from FamilySearch.org, has the contrast enhanced to show more detail. Both are fairly good images, but the second one probably shows more detail than than the first even though it appears darker. 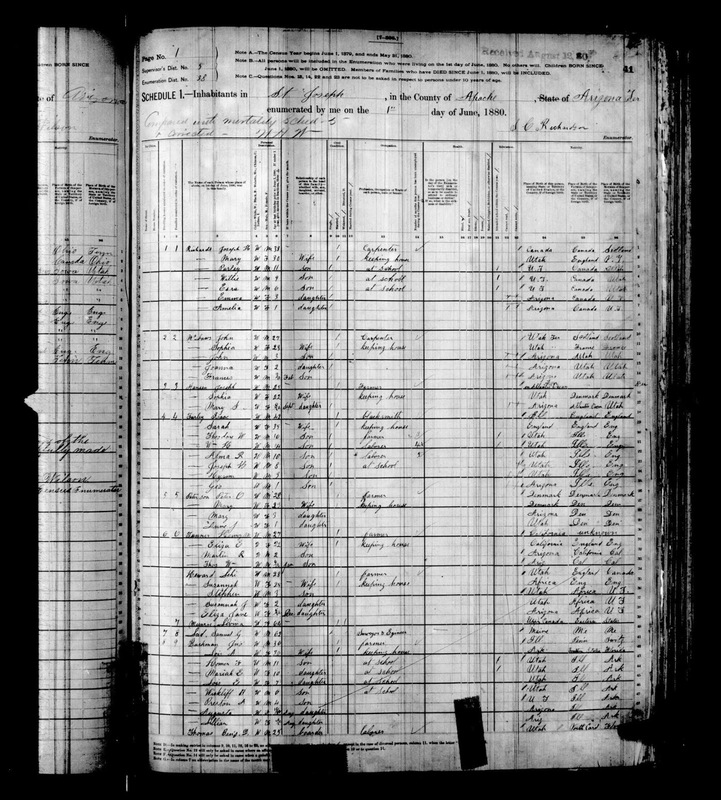 Here is a current digitized image from FamilySearch.org. The format of the way the image was taken reveals that it was taken directly by a digital camera. 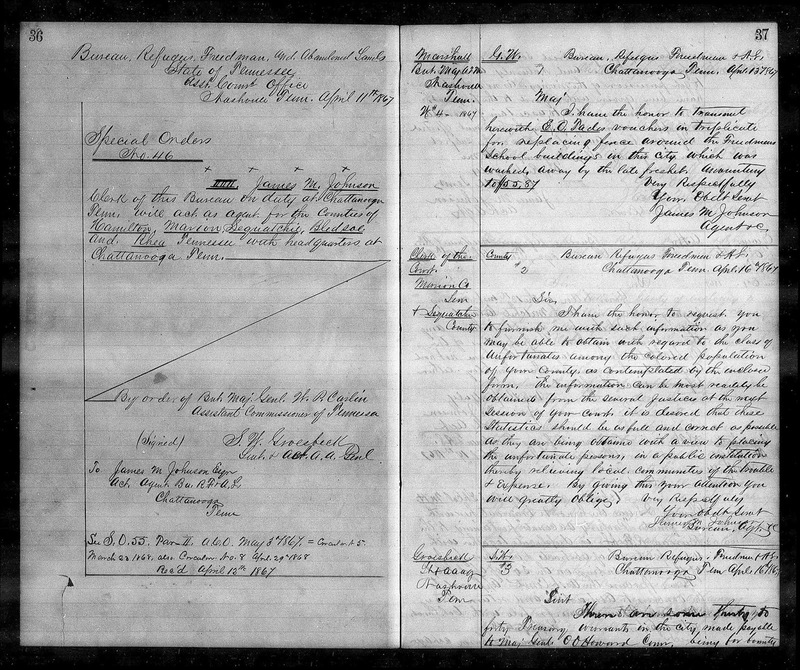 This is a sample of the Tennessee, Freedmen's Bureau Field Office Records, 1865 - 1872 from Chattanooga, Tennessee. You can see that the quality of the digital image is still very good even with some bleed through from the backside of the document. The point here is that the limitations of the original often eclipse the sophistication of the technology and that there is little that can be done to enhance an image even with modern technology because of time and cost constraints. Would a modern scanner produce a better image? Yes, likely, but the problem is that the originals are not in a place nor do they have the format that would lend itself to using some type of scanner. Most of the discussions about making a comparison between using a scanner versus using a camera revolve around the issue of resolution. Cheap scanners could make a higher resolution image than a cheap camera. Archive quality digital cameras were extremely expensive. The main issue was and still is, the resolution of the image. It was not until relatively recently that consumer or prosumer digital cameras achieved an acceptable resolution. I will have a lot more to say about the technical aspects of making digital images in successive posts. Quick transfer of images to a computer or storage device. Can be used with very large documents. More likely to be allowed by a record repository. The cost of a good quality camera is considerably more than the cost of a good quality scanner. Depending on the digitizing requirements, additional equipment, such as a camera stand and lights might be necessary. Maintaining the proper focus across the entire image may be difficult, i.e. keeping the document flat with damaging the document. Avoids much of the bleed-through on pages. Relatively inexpensive for good quality. Bulky, cannot be used at all in some document locations. Much slower than a camera. Original documents may be injured in the scanning process. Some documents cannot fit on the scanning bed and would have to be scanned in sections. Not as frequently allowed by record repositories. One of the most common discussions about the use of scanners and/or cameras revolve around the distinction between scanning a photo and scanning text (i.e. documents without pictures). In this series, I hope to show that digital cameras have evolved to the point where they are more than just an alternative to scanners, but now have become the most effective tool for genealogists and archivists of all kinds. London, England (February 27th, 2015) Famberry (www.famberry.com), the private collaborative family tree builder, is please to announce the release of “Famberry Search”, an interactive search facility that uses key indicators from your family tree to give you the most relevant search results and an opportunity to connect with related family. The more you add to your family tree the better the Famberry Search results. 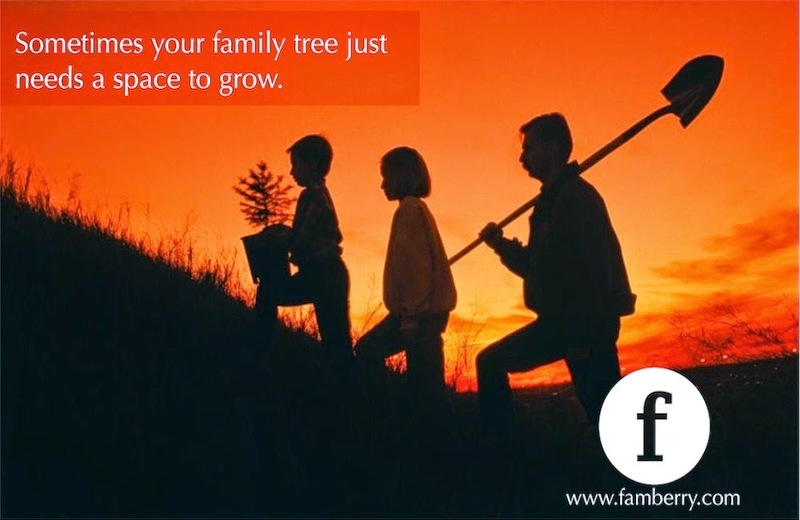 In addition to the standard checks for matches as you grow your family tree on Famberry, the Famberry Search facility will help users who have hit brick walls with certain names and want to check for any other families that have connections to specific names. As part of the announcement Famberry is also releasing GEDCOM import and export facilities to allow users to transfer family tree information from their private applications to the sharable family tree environment of Famberry. This seems to be a concept that is getting more popular, the idea of having a relatively simple family tree structure that allows collaboration and connectivity. I think the die-hard genealogists are not going to be attracted to this type of program as their primary database, but it could be very attractive for families not entirely embroiled in family history, not as a substitute for more detail, but as an adjunct. My apologies to Shakespeare, but there is a real issue over the now ancient GEDCOM standard. I liken it to those undersized spare tires that come with many modern cars; useful in an emergency but lethal if used too long or too much. It is sort of in the category of the venerable Personal Ancestral File program. It still has adherents and almost fanatical defenders. For me, of course, this journey down memory lane reminds me of the "good ole' times" when we were embroiled in the issues of genealogical data standards. It looks like to me that the partnerships being forged between the larger genealogy companies and the concomitant agreements concerning the APIs back and forth, have predictably obviated the need for a separate genealogical standard. This is especially true due to the background of discussion about the ability to move data from one online tree program to another. At a very practical level, I consider the use of GEDCOM files to transfer the data from one large family tree to another, to be the point at which the family history industry moves decisively away from source-based reality into the never-never land of imaginary pedigrees. Uploading a huge unsourced family file into the FamilySearch.org Family Tree, for example, would be a disaster for the descendants of all those whose ancestors have now been duplicated. Notwithstanding my fear of this eventuality, I still hear a constant background of noise about the need to upload an entire file and using the GEDCOM file format is presently the only way this is possible. But using the GEDCOM format is like taking photos through a screen door. You get some of the details and lose others. Individual programs have addressed the need to move the entire data set from one computer to another, but the idea of moving an entire file from one program to another has languished. So here go the pros and cons of GEDCOM as I see them today (February, 2015). Before I get to the list, I have a comment about large genealogical data files. I have seen files that contain well over 100,000 individuals and some that have grown much larger than that. I am certain that people with such huge files have either spent their entire lives adding people one by one or have copied huge amounts of data from other files. Do you realize that if you had 100,000 people in your file, it would take over 1600 hours just to look at each person for a maximum of one minute? Enough said on that topic for this post. GEDCOM is presently the only practical way to move a large genealogy database from one program to another. There are limited methods of transferring and synchronizing data between two programs, especially when those two programs are owned by the same company such as an online family tree and the supporting desktop program, but there is no other way to move an entire file from two unrelated programs. For basic data fields, GEDCOM does an very good job of preserving the existing file structure. It is relatively easy to understand and export a GEDCOM file and then import the file into another supporting program. GEDCOM exports and imports are still supported by the majority of genealogical database programs on all computer platforms and operating systems. GEDCOM has been a way to maintain reasonable data correspondence between different program. Depending on the program, a considerable amount of the existing file data may be lost in the transfer process since there are fields and types of media that GEDCOM could, but does not usually support depending on the program. For example, source documentation in Personal Ancestral File does not transfer well into almost all other programs. Using GEDCOM facilitates the transfer of large, unsupported, unsourced and inaccurate data files. Much of the proliferation of inadequately sourced, online family trees is a result of the use of exporting and importing GEDCOM files. The need to support the GEDCOM standard has imposed arbitrary limits on the way genealogical information is stored and disseminated. Adding GEDCOM files to an existing family tree may create a large number of duplicates. For this reason, FamilySearch (the organization that originated GEDCOM) now requires uploads to be examined one person at a time and current implementations of the process in the FamilySearch.org Family Tree does not support notes, sources or multimedia. These lists are not exhaustive, I intended them to merely indicate the nature of the problems. I am certain that as time passes, there will be ways to exchange data between two online family trees in unrelated websites, either directly or through the mediation of a third party program. You need to check back on the RootsTech.org website for the latest postings of newly added recorded classes from the Conference. There are now 31 sessions online. If you need a place to start. Watch Ron Tanner. 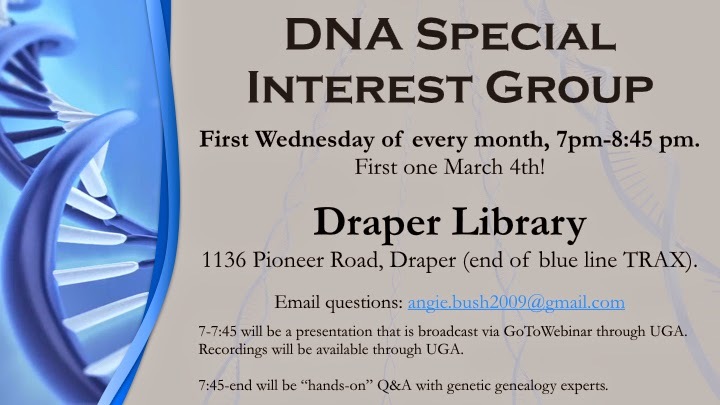 You are invited to our members-only DNA Special Intrest Group on Wednesday, Mar 4, 2015 at 7:00 PM MST If you are attending in person: The meeting will be held at the Draper Library, 1136 Pioneer Road, Draper (end of blue line TRAX) from 7:00 pm to 8:45 pm. A presentation and Q&A will take place from 7:00 to 7:45 and will be followed by a hands-on session with the experts from 7:45 to 8:45 pm. Please bring your laptop and DNA research questions with you. If you are unable to attend in person: You may register for the presentation portion of the meeting which will be broadcast via GoToWebinar® from 7:00 to 7:45 pm MST. You may register here: https://attendee.gotowebinar.com/register/2529497233223364354 After registering, you will receive a confirmation email containing information about joining the webinar. Seating is limited; however, it will be recorded and saved behind the member's wall on the UGA website for future viewing if you are unable to join. The Utah Genealogical Association provides genealogical information, sources and education through personal instruction and published media on state, national and international family history topics, while promoting high standards and ethical practices. The Utah Genealogical Association was formally organized on September 25, 1971, and chartered on December 1, 1971, by the State of Utah as a nonprofit educational organization. The Association's interests are worldwide while still providing specific materials of interest relating to Utah. It is not affiliated with any religious or political organization. The Association is governed by an Executive Committee comprised of the President, 1st Vice-President, and 2nd Vice-President plus a Board of Governors. Members of the Board are elected by the general membership of the Association and serve for a period of three years. In addition, dozens of volunteers serve on various committees, staff booths at conferences, and work behind the scenes to assure the membership a vibrant, collegial, and enjoyable Association. The Association publishes Crossroads, a quarterly journal of general interest in the field of genealogy and family history. The journal is sent to the general membership of the Association and is also available to the membership in an electronic edition on this website. Association members can share information on specific surnames through our Surname Research page. We sponsor an annual meeting wherein outstanding service and accomplishments are recognized and awarded. Also available to members is the opportunity to participate in a monthly "virtual chapter" meeting wherein experts in various aspects of genealogy and family history make hour-long presentations on their areas of expertise. These presentations are then archived for member review and access at any time. We are pleased to let you know that the census conducted in Denmark in 1930 is now available on MyHeritage, with full images and a complete index of 3.6 million names. This is the first time this important collection of historical records has been completely digitized and made available online. It was done as part of a large-scale digitization project by MyHeritage under agreement with the National Danish Archives. The 1930 Denmark census will be automatically compared to your family tree and you will receive notifications on Record Matches whenever MyHeritage finds census records relevant to individuals in your family tree. The 1930 census is the first of many Danish record collections that MyHeritage will release during 2015 and 2016. The total data set will include approx. 120 million names, and will include Danish census records from 1787 to 1930 and Danish Parish records from 1646 to 1915. Most people with ancestors from Denmark will be able to find them in this data set, more than once, and learn more about their life stories and relatives. Many family history mysteries will be solved and new leads will be found. People with Danish roots will be able to trace back their ancestors many centuries back. Next on our list: the Danish censuses of 1880 and 1890. We are currently digitizing them and will bring them online on MyHeritage very soon. We are committed to digitizing important historical records that have never been digitized before, for the benefit of genealogists and family history fans. We hope the 1930 Denmark Census will be useful for your research and help you make many exciting discoveries. Digitizing Genealogy -- What is digitization? Genealogical jargon can sometimes be difficult. This is especially true when overlaid with legal, scientific, DNA, or technological jargon. In the technological side of genealogy, you will frequently hear the word "digital" in all its forms (digitalize, digitalization, etc. also you may see it spelled with an "s" rather than a "z" in Great Britain). What is all this? It gets a little bit involved to understand the concepts and what is actually going on when we talk about digitizing something. Stay with me and I will walk you through how all this came about. Since ancient times, humans have tried to capture and preserve their impressions of the physical world. The cave painting depicted above is an example of what could be called an "analog" image. What we mean by an "analog image" is that the method of reproduction of the physical reality is also a physical reality. At the time this image was painted on the wall of the cave, there really was a bison out there in the world running around and eating grass. The technical definition of an analog image would be something like this: relating to or using signals or information represented by a continuously variable physical quantity such as spatial position or voltage. 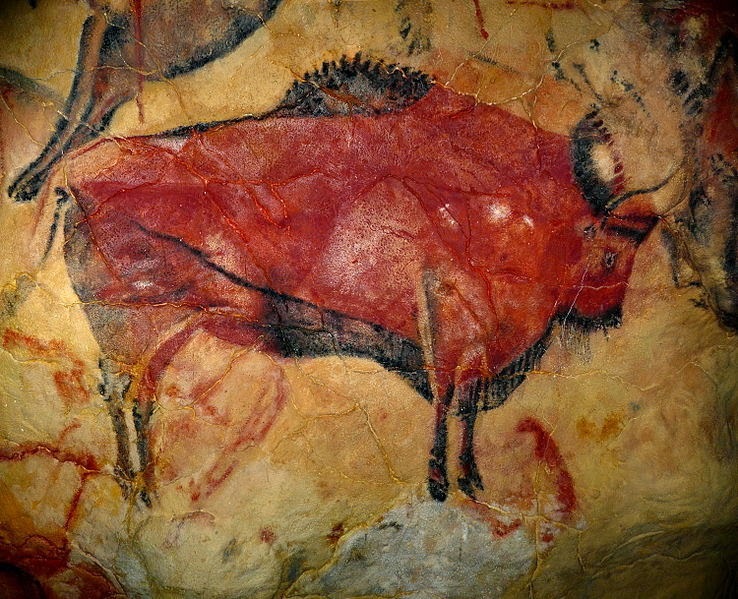 In the case of the cave painting, the "continuously variable physical quantity" is the paint used. When a genealogist looks at a document or other record of the past and copies out the information contained in the document, he or she is making an "analog" copy of the information using a pen or pencil and a piece of paper. Obviously, the cave painting above is not an exact replica of the original bison. Just as obviously, the pen or pencil copy of the information in a source document is also not an exact replica of the original. But for thousands of years, the only way to make a copy of a document at all was to copy it by hand. Printing was invented to speed up the process and enable the printer to make multiple copies of the same document. But each of those individual copies was still an "analog" of the original. Making any changes to the original analog copy essentially required remaking an original. If a painter painted a painting of a landscape, the only way I could acquire a copy of the painting was if someone copied the original in some format. In 1725, the limitation on making copies of an original began to change when Johann Heinrich Schulze made fleeting "photographs" of words by using stencils, sunlight, and a bottled solution of chalk and silver nitrate, simply as an interesting way to demonstrate that the mixture inside the bottle darkens where it is exposed to light. See Wikipedia, Timeline of photography technology. If we fast forward through the history of the development of photography, we see that what was happening was that the inventors and developers of the photographic process were working on a new analog process of reproducing images. As photography developed, it became possible to use a camera to take a negative image (first negative invented in 1835 by Henry Fox Talbot) and then make as many positive image copies as desired of the "original" analog photograph. The media for the analog image was the glass plate or film. See Wikipedia, Timeline of photography technology. Fast forwarding this whole process, for genealogists, the breakthrough for preserving documents came with the introduction of microfilm copies of the originals. The earliest microphotographs were made by John Benjamin Dancer in 1839, shortly after the introduction of the daguerreotype process. See Wikipedia: Microform. It is important to remember that all this fancy photographic stuff was still an analog of the physical reality as long as it involved some kind of physical film for capturing the image. What was important about film photography was the ability to make multiple copies rather cheaply and easily. Photography did for images what book printing did for books. The first digital image was produced in 1920, by the Bartlane cable picture transmission system. British inventors, Harry G. Bartholomew and Maynard D. McFarlane, developed this method. The process consisted of “a series of negatives on zinc plates that were exposed for varying lengths of time, thus producing varying densities,”. The Bartlane cable picture transmission system generated at both its transmitter and its receiver end a punched data card or tape that was recreated as an image. What happened here is that the "analog" representation of the physical reality had been transformed into a coded representation of the original in the form of electrical impulses. You could argue that this was still an "analog" image and that the medium of transmission had merely changed, but this development was significant to warrant a new category of "digital images." The word "digital" in this context focuses on the fact that the physical reality of the original is represented by a stream of electronic impulses. 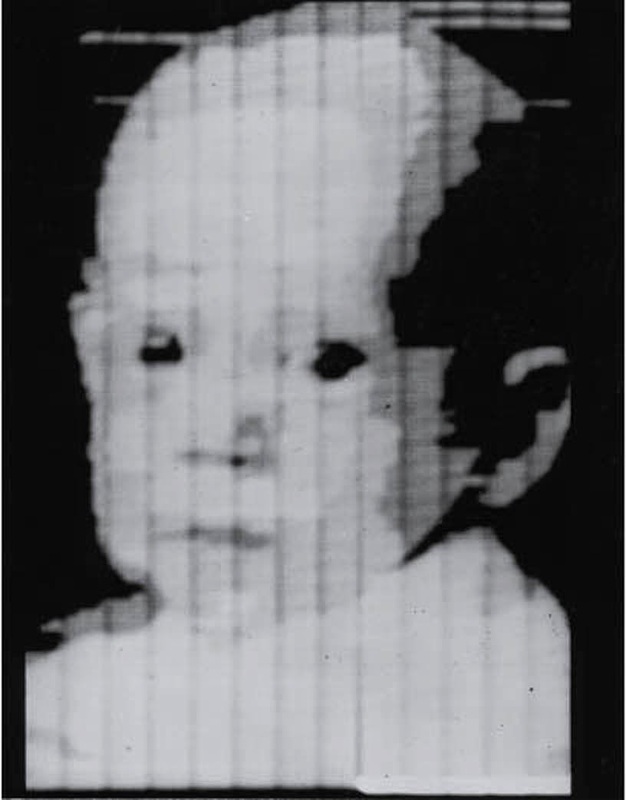 In the case of the original image transmission back in 1920, the punched data card or tape, was not recognizable as an image until it was processed by the receiver. The first digital camera is believed to be developed by Kodak in 1975. See "The World’s First Digital Camera by Kodak and Steve Sasson." Although the circuits and the devices have become smaller and smaller, the idea that an image can be made by discrete electronic sensors is at the heart of a digitalization. You could argue that the first movable type book was merely a small step from the original handwritten books, but this small step changed the world. Likewise, the first digital images began the same fundamental revolution in the way information was processed and transmitted. So, digitization is the process of taking a physical object (book, document, etc.) and using an electronic sensor, transforming the light rays from the object into a series of electronic impulses that can be transmitted, stored, manipulated and altered in an almost infinite number of ways. The introduction of the FamilySearch.org App Gallery indicates more than just the number of programs becoming FamilySearch Certified. It also indicates some important messages about the present direction of the entire computer world and the direction technology as it applies to genealogy is moving. Here are 10 things that tell us a lot about genealogy, mobile apps and why they should not be a surprise to anyone. No.1: The sales of mobile devices outnumber stationary, desktop devices. The number of mobile devices sold in 2014 so far out paces traditional desk-type computers that there is no doubt where the market is going. According to Gartner.com, a online consulting firm, traditional PCs sold at the rate of 308,472,000 in 2014 while mobile devices, including smartphones, tablets, and similar mobile devices sold 2,432,927,000. In short, there were over 2.4 billion mobile devices sold. See "Gartner Says Worldwide Traditional PC, Tablet, Ultramobile and Mobile Phone Shipments to Grow 4.2 Percent in 2014." No.2: More and more people are using their mobile devices exclusively for their computing. My own observations indicate that tablets (including iPads, iPhones, and other portable devices) are becoming ubiquitous. This year at RootsTech 2015, many of the bloggers were using their iPad or tablets for their portable computer. This was particularly true among the younger, "lifestyle" bloggers that were there by invitation from FamilySearch. The were still a few of us diehard laptop folks, but even the presentations that I have seen lately were done with an iPad. No.3: The so-called "Apps" for mobile devices are daily growing more sophisticated. In a recent presentation from Bruce Buzbee, the head of RootsMagic, the popular genealogy program, he indicated that many of the functions of the standalone program would be ported over to the mobile app. As the numbers quoted above clearly indicate, if the developers want to expand their market, they will have to move into selling mobile apps and making them more functional. FamilySearch is also indicating that significant changes will be made to their mobile apps in the future. No. 4: The variety of programs available for mobile devices far outpaces the development of new desktop, local computer based programs. I do get upgrades to the programs on my main computer, but most of the new programs coming out today are designed to work on mobile devices. It is rumored that Apple's coming operating system will essentially combine the present OS X system with Apple's iOS system into one system that runs the same on all devices. No. 5: We are right at the transition point where mobile computing become the norm. I use my iPad for many things I used my desktop computer for just a few months or years ago. When I bought my present iPad, I looked at the possibility of adding a keyboard and decided that I still needed the connectivity of my laptop. I am in the process of rethinking that position again. No. 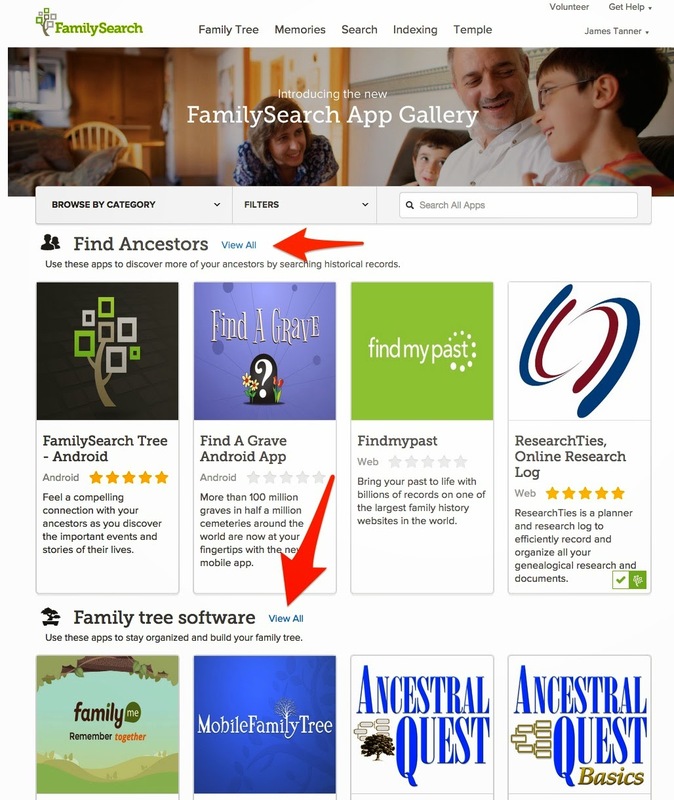 6: The selection of mobile apps shown on the FamilySearch.org App Gallery will increase dramatically over the next few months. Many of the programs that are featured in the App Gallery were there before when they were listed as products. But the number of new web-based apps is clearly growing much faster than apps designed for Windows or Mac OS X. No. 7: Since most of the programs I now use are either web based or have a web component, moving to a mobile device is a natural transition. As more and more programs become web-based, the need to have a separate copy of the program for each device diminishes. As long as I can access the Internet, I have access to all of my programs. There is no need to have a stationary computer to hold all of my programs. Now, this works as long as I remember to keep all of my working documents stored in web-accessible applications. No. 8: Voice recognition software is becoming more and more useful. Most of the mobile devices today integrate voice recognition features. Presently, I find the mobile devices don't work all that well. However, I am certain that the voice recognition software on these devices will improve dramatically over time, just as the cameras already have. Using a keyboard will not become the obstacle that it is now. No. 9: The capabilities and storage capacity of mobile devices will eventually exceed those of the desktop computers we have today. Eventually is an interesting word. Computers are changing rapidly enough that even those of us who are rather old will likely see a few more rounds of changes. Much of the research and development is directed at mobile devices and it is very likely that ways will be found to add interfaces that will let us add and store information more easily. No. 10: The integration of web apps with mobile devices will expand their capabilities to match those of desktop computers. I'm not looking to replace my desktop computer with a mobile device anytime in the future, but even today, that is entirely possible. The two things I need the most, a large screen, a good keyboard and massive storage is available for mobile devices now. As long as I can connect my mobile device to a large screen (which I can do now) and a keyboard (which I can also do) there are few barriers left to overcome before I move entirely to a mobile device. What this means to genealogists is rather simple, They use computers. They use mobile devices. Eventually, all of the genealogy companies will realize this and the programs will be ported to the mobile devices. It has been a couple of years since I last wrote about the digitization process from a practical standpoint. It is time to review the products, methods and reasons for converting our paper copies to digital images. The overall process seems simple enough, the paper document is scanned/photographed and the image is then attached to the pertinent individuals in a genealogical database program and/or an online family tree. But it turns out that the details of such an operation can be overwhelming to many genealogists. This is the first part of an ongoing series on the entire process of digitizing documents. I intend to include both the mechanics and theory of the process including most, if not all, of the options. I also intend to discuss the pros and cons of digital copies vs. original paper and the serious issues of digital preservation. The equipment for making very high quality digital images is very rapidly evolving. Just one example, Canon has announced a 50.6-Megapixel camera for introduction in June of 2015. Much of the previous discussion about making digital images centers around the issue of flatbed scanners vs. cameras for archive images. The resolution of the images is a controversial topic among archivists and others concerned with the quality of the images. As the equipment available for consumer use increases in quality, these quality issues become more and more esoteric. My intention here is to meld my 62 years of photography experience with my 46 years of computer technology experience and explain the issues and details of the issues in terms of my now 33 years of genealogy experience. In the process, I may also discuss the legal/ethical issues based on 40 years of legal experience. I will also throw in, for good measure, my perspective of working and living in libraries and archives for the past 62 years. The proliferation of cameras coupled with phones, makes estimates of the number of cameras in use today almost impossible. Some estimates run as high as 5.8 billion cameras in use around the world out of a total population of 7 billion and that includes a figure of 1.8 billion sold in 2014. As a result of this expansion, many genealogists are likely carrying around a camera that is perfectly adequate for document preservation and don't even know it. Recognizing this change in technology, there are a very few archivists who are seriously considering the use of consumer level cameras for archive purposes. See the University of Illinois at Urbana-Champaign Digital Historian Series. At the same time cameras have evolved from the specialized purchase option into something everyone carries around all the time, the scanning technology has also rapidly evolved and the cost of a high quality multipage, double-sided, sheetfed scanner has dropped dramatically. The prices of all types of scanning equipment have plummeted and today the cost of setting up a scanning operation is minimal compared to the cost of the labor to do the scanning and catalog the results. At the same time, the field of digital preservation is fraught with its own dangers and concerns. Access to existing paper collections is spotty throughout the world. Many genealogically significant records are still "locked up" by bureaucratic red tape and concerns about legal rights. The monetization of records is also a concern. Of course politics plays a huge part in the availability of records and repressive governments are not limited to developing countries. As technology makes taking the images less expensive, both public and private repositories and archives are seeing the revenue value of their collections and limiting reproduction rights to preserve cash flow. The issues that accompany digitization do not end with the production of a digital image. What happens to that image after it is produced is probably as important as the creation of the image itself. Many large companies today make sizable incomes from the process of organizing and displaying digital images of documents. Now, to summarize, this series will touch on as many issues as possible across the entire spectrum of using digital images for genealogical research and preservation. Rather than numbering the series, I will tag the posts with the words "Digitizing Genealogy" and all the posts in the series will appear in the sidebar list of topics I have created. You may have to scroll down a ways to the list, but the series will be there and available. In the last few days, I have had a number of conversations with genealogical researchers that caused me some alarm. They have been discussing various computer problems and when I ask about backups they seem confused at the question. There are some genealogical database programs that make automatic backup of data and some that even back up all of the "media" or attached documents and photos, but if you allow the program to "backup" the data and put the "backup file" on the same computer you are working on, there is no true backup. If the hard drive or operating system of your computer goes south, you will still lose all your data. This seems to be a particularly severe problem among genealogists who only work on their family history every so often. It is also a problem for researchers who are not very computer savvy, but can be a problem even for more experienced researchers. There are different levels of possible data loss. Here is a list of ways you can lose your genealogical data. You can fail to save you work as you go along. Many program save genealogical work as it is entered, but other types of work, such as word processing programs, spreadsheets and database programs may not have automatic save functions. As you work, you should periodically, say every hour or so, check to see that your work is saved. Here, I speak from a lot of experience. From time to time, I lose work when I click on the wrong button and delete a file rather than save it. The file you are working on can become corrupted. There is no way to identify the many different ways a file can get corrupted. This happens less frequently than my failure to properly save a file, but it does happen. It can happen if you are working online and there is a power failure, even for a brief period of time. You can suffer an operating system failure. There are a myriad of ways that the operating system of your computer can crash. Many crashes are seemingly random and do not re-occur. If your computer is crashing frequently, there is something fundamentally wrong and it is in danger of a permanent crash where all the data is lost. Something physical happens to the computer. It is dropped or a power surge or lightning strike fries its circuits or dogs or children or whatever. This includes fires, floods, earthquakes, storms, tornados, etc. The list could go on and on, but you probably get the idea. Things can happen without notice and without you being able to prevent the crash. If you think about this list, you will see that there are two issues; one is damage to the way the computer works and the other is damage to the place where the computer is located. Depending on the type of damage, backing up the data may or may not work so well. If the damage comes because of a computer centered event, then you need to have the data stored on devices that are independent of the computer itself. Presently, there are several physical options: hard drives, flash drives and CDs or DVDs. The only sure way to prevent loss of data from physical destruction of the computer system is to store the information off-site. The best practice is to do both. Let's look at each of these backup methods and the cost. The most common and cheapest way to back up your computer is to copy the data either automatically or manually to an external storage device. Here is a list of each of the available devices and their cost. First local storage attached to or created by your computer. These devices are on their way out. Many computers sold today do not have a CD or DVD drive. The issue with these devices is two-fold. Many of the files we create today for images, including photos, document scans, downloaded files etc. are much larger than the capacity of these disks. The capacity of an average individual CD is about 700 MBs. This is not enough to store more than a few photos. My photos usually run about 50 MBs in size. DVDs vary from 4.7 GBs to 17 GBs. My current backup files comprise approximately 3.3 TBs or almost a thousand times more than one of these disks. The time involved in using CDs or DVDs for back up for me has long ago become impractical. If your files are much smaller, you can still consider this method of storage. But remember, the backups need to be regular and reflect the amount of work you would be upset to have to do over. CDs cost about $25 for 100. DVDs cost about the same price for 4.7 GBs and 8.5 GBs storage capacity, higher capacity disks are harder to find. Solid state memory storage devices are now becoming more and more popular and therefore cheaper. There are also solid state hard drives with greater capacity. They are fast and reliable. The greatest danger in using smaller flash drives (also called thumb drives) is that they get lost easily. They are commonly sold now in sizes from 8 GBs up to 256 GBs. Lower capacity flash drives are given away as premiums. But to purchase a 2 GB drive costs about $2 to $5. High capacity drives are about $30 for a 256 GB Drive. External Solid State Drives (SSD) are about $450 for a 1 TB drive. The prices for hand drives has been steadily falling. For very large files, they are the media of choice. A 1 TB drive will be more than adequate for most genealogists. If you have a lot of photos or videos, you can purchase drives with up to 6 TBs of storage. That is more than most people can comprehend unless you are storing a lot of movies or hundreds of thousands of photos. A 1 TB Hard Drive costs about $60. A 4 TB Hard Drive runs about $120. You can see that the cost per TB drops considerably with a larger drive. A 6 TB Hard Drive is running about $250. The price per TB increases because the drives are not yet very popular. The simplest way to do offsite storage is to make a back up to a hard disk drive or other type and store the copies in an offsite safe location. I make copies of my files and give them to my children to store. This works well and then they have access to the data. If you can't depend on your children or they are too young, then another relative or friend might work. You have to remember to do this regularly. If there is a natural disaster in your area, you may not have an Internet connection. But this is still another way of storing a large amount of data. You need to be very much aware of the Terms and Conditions of the online storage companies. Some of them will erase your data or lock it up, if you do not make the periodic payments. I have seen unlimited storage for a little as $5 a month. When making backups of your data, it is a good idea to take into account the time it takes to make a backup. I have an automatic backup system on my computer, Apple's Time Machine, and it works very well and keeps the computer backed up constantly. There are similar programs for Windows PCs. If I did a complete backup of all of my files, it would take two or three days to complete. A word to the wise. The product will not be shipping until June, so I will not be able to demonstrate my own photos until it comes out. How do we maintain multiple online family trees on multiple websites? There are literally dozens of online family tree programs. Of course, I still talk to genealogists who have all of their years of research on a floppy disk using the Personal Ancestral File program, but the number of such individuals is slowly starting to diminish. Many have now migrated to another desktop program but there are still a huge number of researchers that have yet to put anything online to share with their families. When they are finally convinced that putting their family tree online is a good idea, they, like the rest of us, are confronted with all the variety of places to maintain an online family tree. How do you choose which family tree program to use and why, on earth, would you even consider using more than one? This is a real issue. The major concern is the ability to synchronize the data entered into more than one online family tree. If you choose one of the three programs that can synchronize data between a desktop program and the online FamilySearch.org Family Tree, then the problem is resolved. Those programs can be found in the FamilySearch App Gallery. I suggest that when you view the App Gallery, you make sure you click on the small links to "View All." Here is a screenshot showing the location of the links. Both Ancestry.com and MyHeritage.com have desktop programs that synchronize with your online family tree or trees. Ancestry.com has the Family Tree Maker program for both Windows and Apple OS X users. Likewise, MyHeritage.com has its own desktop program, Family Tree Builder, that synchronizes with the family trees you have on the online program and is also available for both Windows and Apple OS X users. In addition, the RootsMagic desktop program not only synchronizes data with FamilySearch.org's Family Tree, it also views Record Hints on the Family Tree and Record Matches on MyHeritage.com. In addition, the Heredis genealogy program, has its own online family tree and programs for both Windows and Apple OS X. Heredis also allows you publish your family tree online through Heredis Online. The ability of these programs to exchange and synchronize data between online family trees will continue to expand. But what if you want to utilize the automatic search capabilities of more than one program? The idea that you might have more than one or at most, two family trees to maintain is daunting to say the least. Of course, the cost of maintaining more than one online tree or even more than one desktop program must be taken into account. I suggest that you may wish to think this through a little more comprehensively. Each of the programs present some unique advantages. This is especially true for the programs such as FamilySearch.org, Ancestry.com, findmypast.com and MyHeritage.com that do automated record searching for hints. There are some huge advantages in having a family tree on each of these programs. Here are some suggested approaches to multiple family trees. Make one family tree program your primary family tree. Try to keep this tree complete and up-to-date. Ignore trying to maintain the other family trees up-to-date. This primary tree can either be one of the online websites or a desktop program as you choose. Use the other family trees as research aids or as ways to contact relatives and to warehouse sources. Do not worry if they do not contain all of the information in your primary family tree. Use the other family trees to focus on a particular research issue. Move sources from the other trees to your primary family tree as an archive. Make sure you backup and maintain your primary family tree. If you can do so, use a program that will synchronize between a desktop family tree and an online one as your primary program, this simplifies both a back up and sharing the information. If the idea of having more than one family tree is too overwhelming, then focus on one program entirely but be sure to back up your data. Keep your chosen master program updated and current. If the program becomes unsupported for any reason, i.e. abandoned by the developer, immediately transfer all of your data to another current program. If you decide to use a an online family tree as your primary repository, make sure you can export the data to another program. Some online family trees have gone down and given their users only a short period of time to save the online data. This issue depends on the amount of data you have. The larger your online file, the greater the need to have a desktop backup of the data. This is a complicated subject and I could probably keep writing indefinitely from my own experience in trying to maintain multiple databases. If you have your own theories, you are welcome to add them here as comments. I haven't written about the Digital Public Library of America (DPLA) for a while. They have been busy adding more and more resources. Presently, they have 8,416,443 items online for free access from around the United States. This is one of those websites around the world that keep acquiring digital content without much fanfare in the genealogical community. For example, the DPLA has over 700,000 digitized records from the National Archives. That is probably getting close to the largest collection of these documents anywhere online outside of the mainly military records on Fold3.com. Interested in using DPLA to do family research, but aren’t sure where to start? Consider the family Bible. There are two large family Bible collections in DPLA—over 2,100 (transcribed) from the North Carolina Department of Cultural Resources, andanother 90 from the South Carolina Digital Library. They’re filled with rich information about family connections and provide insight into how people of the American South lived and died during the—mainly—18th and 19th centuries. Prior to October 1913 in North Carolina, and January 1915 in South Carolina, vital records (birth and death, specifically) were not documented at the state level. Some cities and counties kept official records before then, and in other cases births and deaths were documented—when at all—by churches or families. Private birth, death, and marriage events were most often recorded in family Bibles, which have become rich resources for genealogists in search of early vital records. One of the frustrating things about the digitization of records through out the world is that many of them dealing with a particular area or time are in fragments located in different online databases around the world. The DPLA is trying to consolidate records from a variety of institutions around the country. It has a long way to go, but it is getting more and more support and the number of records it links and searches online continues to grow. Apparently those who promote DNA testing for genealogical inquiries feel compelled to explain all of the genetic intricacies of the program. Almost every class or presentation I have had on the subject has involved a huge amount of jargon. Years ago I became interested in synthesized music. I took an opportunity to visit a store selling some of the newer keyboard synthesizers in Scottsdale, just north of my home in Mesa, Arizona. The sales person in the store, talked to me about the different models available, but used a huge amount of music/technical language. Since I was just starting out in my interest, I was soon lost. As I left the store I said to myself, in two months I will know more that that salesperson about synthesizers and I did. Much, much more. I set up a complete sound studio and recorded some music. This example illustrates and interesting point. One thing I learned in law school was that if you wanted to be a lawyer you had to sound or talk like one. Producing the jargon is one of the ways to increase the mystique of any pursuit. Genealogists are just as guilty of using jargon as any other technical pursuit and now genealogy is permeated with computer jargon as well. So here we go again, adding another layer of impenetrable jargon in the form of DNA terminology. If I wanted to impress people with my legal knowledge and promote myself as a lawyer, I would do two things. First, I would write about complex subjects and throw out a lot of legal jargon and a few Latin phrases, such as tort, replevin, etc. But secondly, at the same time, I would try to make all that mumbo-jumbo understandable. As a side note, the latest edition of Black's Law Dictionary has 7,500 terms new to the 10th edition. Talking the talk distinguishes an "expert" from the novice. Self-styled DNA experts are no different than synthesizer salesmen or lawyers. They impress people with their knowledge of the subject for the purpose of self-promotion or to sell a product. This is also why there is a 10th edition of a law dictionary first published back in 1891. I recently read a scholarly article submitted to a journal by one of my own children. Fortunately I have an extensive vocabulary, but nonetheless, the article was all but impenetrably permeated with medical jargon. I commonly tell people to stop me and ask questions if they do not understand what I am talking about, but they seldom do, even when I know for certain I have lost them with my discussion. Why is it that we are so afraid to stop someone and ask questions? One of the main reasons is that we do not want to disclose our own ignorance of the subject. Another good reason is that we do not know enough of the jargon to ask a question at all. This is way it is with DNA today in the realm of genealogy. There is a very important story called The Emperor's New Clothes. The original is by Hans Christian Anderson. When we get into the mode of talking about a difficult subject such as DNA testing, perhaps we need to remember the Emperor and his new fine suit of clothes. Ancestry is continually working hard to improve our site and make it easier to discover, share, and preserve your family history. While we constantly make incremental improvements, it has been a few years since Ancestry has made a major update to the site. We are sensitive to the impact changes have on our members. However, substantial research into the needs of our members and the experience they are having on the website have helped us to see new and innovative ways to reinvent the way we help you do family history. The improved website makes it easier for anyone to discover and tell the rich, unique story of their family, while also helping them to become better researchers. Click on the link above to see more of what's coming. 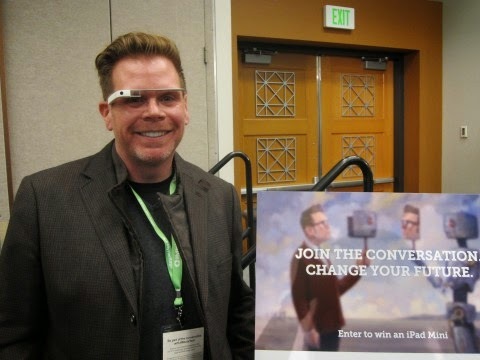 One of the buzz topics of RootsTech 2014 (no that is not a typo) was the presentation by Chris Dancy at the Innovator Summit. Notably, he was wearing "Google Glasses" (now called "Google Glass"). The use of this device and other related "wearable" computer products, became the topic of more than one presentation at the Conference. It looked like a jump into a very different future for computer use in general and for genealogy in particular. There is a very important lesson here and one that should be learned by genealogists: the core activities of gathering, recording and preserving family history have not changed. Technology affects the way we gather the information or do the research; it also affects the way we record and preserve our work, but the evaluation, interpretation and accurate reporting of the work we do as genealogists has not changed at all. There is a saying, "The more things change, the more they stay the same." (English translation of the French "plus ça change, plus c'est la même chose" attributed to Jean-Baptiste Alphonse Karr in the January 1849 issue of his journal Les Guêpes (“The Wasps”). This too can be said about family history and genealogy. It is easy to become dazzled by technology and I have always been an early adaptor, probably because of my very early fascination with science fiction. I was swept into the world of computers as early as 1979 when I worked on a National Science Foundation Project compiling a Shoshone/English, English/Shoshone Dictionary on the main frame computer at the University of Utah Engineering Department. I was painfully aware of all the preliminary work that had to be done before the "computer" could take over and provide us with a printed copy of all of our work. Among genealogists today we have those who embrace the technology for what it does and others who ignore it as irrelevant or too difficult. No matter where we find ourselves on the spectrum of technological adoption, we must recognize that the actual work of genealogical discovery is not being done by the computer programs or devices, it is being done by own effort. I wrote my Master's Thesis on an electric typewriter. I wrote my State Bar Exam for law by hand for three long days in multiple Blue Books. Those days are long gone, but the knowledge and effort that went into both of those intellectual products remains exactly the same. The fact that I now write on a large screen powerful computer has not changed the effort I have to expend to think and reason and record my ideas. It is all too easy to assume that all changes in technology will somehow remove the effort we must put forth to do our work. I now work immeasurably harder today than I could imagine working when I was young. Almost all of that "work" goes on in my head and in the time I spend learning things I do not already know. Although I keep hoping that the next technological leap will change that fact, it seems that the promise of technology keeps moving just beyond my grasp. I still have to expend the effort to accomplish the work. This reminds me of the huge pile of boxes of documents, letters, photos and other genealogically relevant material sitting in a pile in my basement. Even though I have digitized nearly all of that huge pile, the work of organizing, classifying and preserving the digital copies has not magically disappeared. I may not be sitting in a hot field hoeing cotton, but I still have the mile long rows to contemplate. My example from the past year's RootsTech Conference at the beginning of this post is indicative of the need to be selective and cautious in being too aggressive in viewing technology as the solution to the need to do our work. Genealogists, more than anyone outside of the genealogical community, should be acutely aware of race, ethnicity and national origins. Rather than looking at those distinctions as barriers, genealogists should realize that we all come from a mixture and, as is now be demonstrated, all come from a common origin. One of the most pernicious and evil myths of all time is the myth of racial purity. In addition, both ethnicity and national origin are also transitory, ephemeral concepts. The increasingly popular genealogical tool of DNA testing is demonstrating the illusion of all three categories of human existence. Though it may seem like a publicity or fund raising stunt, the Global Family Tree effort is in reality a demonstration of how inter-related the human family really is. Another serious effort to define the human family tree is the National Geographic, Genographic Project. To date, over 700,000 people have participated in the Genographic Project. In the genealogical community, the recent RootsTech 2015 Conference pointed out the increasing awareness and interest in the DNA testing as an integral part of genealogical research. All three of the major commercial genealogy family tree programs, Ancestry.com, MyHeritage.com and Findmypast.com, all have begun integrating DNA testing into their automated source discovery programs. What I have learned about DNA testing is this: you cannot look at DNA evidence for any accurate research data without supporting historical, i.e. genealogical, research to explain and interpret the test results. If you want to get a general look at your ancestry, you can get differing results from different companies, but if you want to solve an ancestral mystery, do your genealogical research first. 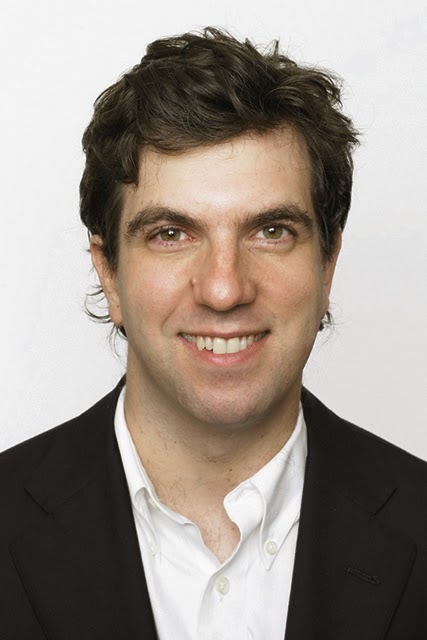 During the recent RootsTech 2015 Conference, I was able to meet and briefly talk with A. J. Jacobs, an author and journalist, the editor at large at Esquire magazine, and a commentator for NPR’s Weekend Edition Saturday. He has given three TED talks with nearly three million views combined. A recent blog post from FamilySearch.org entitled "Top African American Genealogy Resources to Follow on Social Media" provides links to a list of blogs, forums, podcasts, and genealogies leaders that are intimately involved in African-American genealogy. As I watch the stream of blog posts, emails, Facebook posts, Google+ posts and all of the other social media outlets I monitor pass by each day, I'm sometimes in a quandary as to whether or not to reproduce the notice in its entirety or simply post links to pertinent information. Sometimes my posts are compromise between copying the entire article and posting excerpts. In this case, the entire blog post by FamilySearch is of interest. So, in the interests of brevity, please click on the link above to read the article in its entirety. As of today, the entire 1930 Danish census (3.5 million records) is available online. This is thanks to our partnership with the National Archives of Denmark to index and digitize over 120 million records including all available Danish census records from 1787-1930 and Parish records from 1646 to 1915, all of which will be released during 2015 and 2016. We've also added the Swedish Household Examination Rolls from 1880-1920, which includes 54 million records with 5 million color images, of which 22 million records are already available online. The remaining records are scheduled to go online before the end of June 2015. As we announced in December, MyHeritage has entered into an agreement with the National Archives of Denmark to digitize and index over 120 million records, including all available Danish census records from 1787-1930 and Parish records from 1646 to 1915. As of today the entire 1930 Danish census (3.5 million records) is available online! The remaining censuses and Parish records will be released during 2015 and 2016. The 1930 Danish census is a treasure trove of historical information, for anyone whose families originated in the region. It covers Denmark as well as Greenland and the Faroe Islands. The household examination rolls are the primary register of the Swedish church, listing the residents of each parish, their families, and important life events such as births, marriages and deaths. The collection includes 54 million records with 5 million color images of which 22 million records are already available online. The remaining records are scheduled to go online before the end of June 2015. 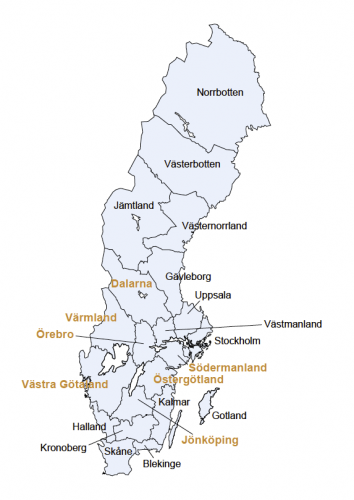 Västra Götaland: In 1997 this county was formed by merging the three counties of Göteborg och Bohus, Älvsborg, and Skaraborg. Dalarna: In 1997 this county was renamed from Kopparberg. Skåne: In 1997 this county was formed by merging the two counties of Kristianstad and Malmöhus. Both my wife and I have a direct interest in these records since two lines of my ancestors came from Denmark and my wife's family has roots in Sweden. In fact, my wife is already used the MyHeritage.com Swedish records to find previously unknown family members in Sweden. We will both be looking forward to the future additions to the MyHeritage.com collections. Remember that when you have a family tree on MyHeritage.com, the program itself will use the effective Record Match and Record Detective technology to find appropriate records for your ancestors. During the past few days at the Brigham Young University Family History Technology Workshop and the Innovators Summit Innovator Challenge, I had some thoughts on the new apps presented at both events by genealogical startup companies. First, I was very impressed with this years products. They represented a broad spectrum of ideas and innovation. Some of the products highlighted were already available, released to the public and ready for the marketplace. Others were still in the conceptual stage. I thought that many of innovative concepts should be developed into complete products, but there were some issues that I felt were unresolved. Many of the proposed products relied on the concept that a "free" app could be monetized by some additional features. This seems to be a common development path for new startups on the Web. There is an underlying assumption that the monetized features are valuable enough to the potential users that the users will convert from a free program to a paid one. It is not difficult to see examples of where this strategy has worked very well such as Pandora, Evernote, Dropbox and many other programs. But the real question that needs to be answered is whether or not the service would have survived without the free component? Would you pay for Google searches if they were not free? It appeared to me that many of these new genealogical startups, although not all, fell into the category of being attractive to users only if the services offered were free. For example, many of the newly announced programs categorize themselves as support sharing photos, audio files, and in some cases, documents. The question to ask is would you pay for a sharing service when all four of the large online genealogy database companies already have pathways (more or less) for sharing family history information either as part of the subscription price or free? There is no doubt that the various sharing schemes in the newly presented programs add value to what is offered by the large companies, but is that enough? Wouldn't it be more likely that the large online companies would develop competing technologies or simply buy one of the more successful sharing companies? 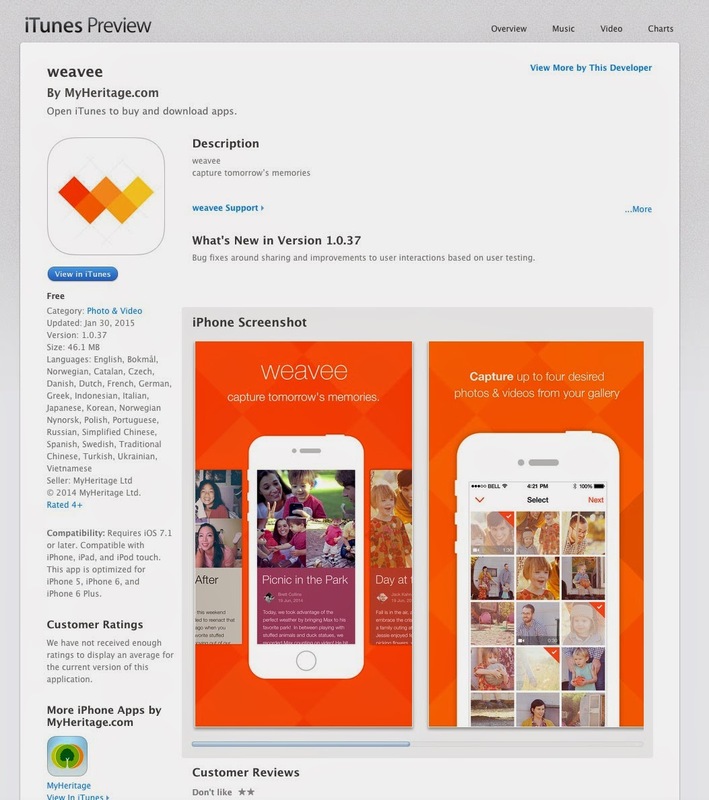 Recently, MyHeritage.com, one of the largest, if not the largest, of the online family tree/data base programs, right before RootsTech 2015, introduced a free sharing app called "Weavee." This is an add-on to the extensive sharing capabilities of the main MyHeritage.com program. It might help to understand the attraction of this app if you realize that MyHeritage.com has more than 74 million members. MyHeritage.com also introduced a free Apple Macintosh version of their popular Family Tree Builder program. The perennial question in software development is how do you compete with free? FamilySearch.org captured a huge segment of the genealogy software market years ago with the low priced Personal Ancestral File program. Eventually, the program was available for free from FamilySearch.org until it was finally discontinued. But it is still available for free from other websites. The large online genealogical database and family tree programs have shown their own propensity to innovate and acquire new technology, if necessary, by purchasing or acquiring other companies. All of them have also announced strategic partnerships. 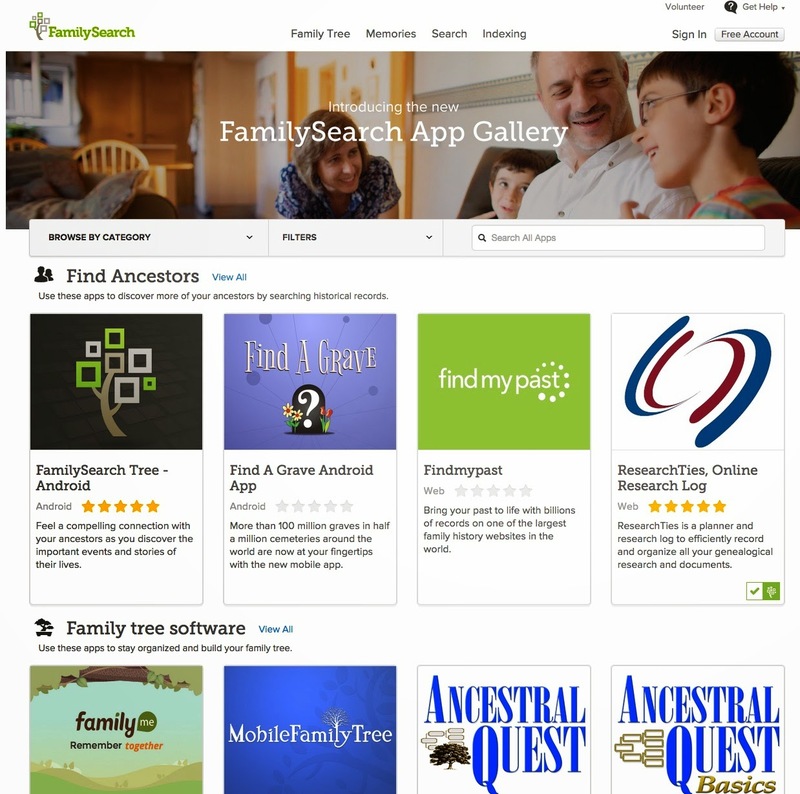 For example, FamilySearch.org has its own "App Gallery," which now, after RootsTech 2015, has 25 apps, including apps from MyHeritage.com and Findmypast.com. Again, it is very hard to compete with free, even if free involves a relationship (and the expense) with a very large company. All of the new genealogical startup companies have my best wishes and hopes for the future. Some of the most valuable genealogy programs today, such as BillionGraves.com, started out as small startup companies. Some notable acquisitions of startups include FindAGrave.com, acquired by Ancestry.com and Mocavo.com acquired by Findmypast.com. In fact, even though BillionGraves.com was not acquired by a large genealogy company, the company was purchased by Otter Creek Holdings, which is a working strategic partner with American Granite and Memorials, Inc. and American Monument (based in Ogden, Utah). Whatever the fate of the new crop of genealogy startup companies, they are adding inestimable value to genealogy and advancing the concepts of what is possible. I hope all of them do achieve success either on their own or as they are acquired by the larger companies. Online family history data is categorized as "intellectual property," that is intangible property. Intellectual property can be bought, sold, rented and of course, inherited. When a person dies in the United States, the property he or she owns instantly passes to a legal entity called the "estate." The subsequent ownership of the property is determined by the inheritance laws of the individual states in effect at the time of the death. Individuals can determine to some extent the disposition of their estate by creating documents such as wills and trusts. Each state also has court rules, in addition to the inheritance laws, that determine the procedures that need to be followed to dispose of the property. Not all property has to pass through probate. If a person transfers ownership of the property before death, the property is not considered part of the "estate." This can be accomplished by either selling the property or transferring it to some sort of legal entity such as a trust or a company. Some people avoid this whole issue by having their company (corporation, LLC etc.) or a trust own all their property during their lifetime. Unfortunately many people do not consider all of the information they have online, including family history data, to be property and they neglect to transfer that type of property before death. Online intellectual property (including genealogy files) create some practical as well legal issues. Most genealogy websites have logins and passwords. Many of these websites also have restrictions concerning revealing those passwords to anyone who is not the registered owner. It is a really good idea to keep a list of all of your passwords in a safe place with your other legal documents. Many people involved in the area of "estate planning" recommend keeping these valuable documents in a safety deposit box. Apparently those who make such a recommendation have never had the experience of trying to get access to a safety deposit box after a person has passed away. The dead person's legal representative may have to go to extraordinary lengths to get access to the safety deposit box because most financial institutions will lock up the safety deposit box until receiving a formal court order appointing an administrator or personal representative of the estate. I believe that some types of valuable personal property are properly kept in a safe deposit box: network passwords and logins are just not that type of property. The next important issue with intellectual property in an estate is the determination of whether or not it has any monetary value. This can be very hard to determine. It may be that the genealogy files contain information that is valuable to genealogists but the files may not have any commercial value. Another consideration is whether the heirs acquiesce to the wishes of the deceased. It is not uncommon for the heirs to disagree over the provisions of a will or trust. That disagreement may extend to a dispute over who "owns" the online genealogy files. All of these considerations strongly indicate that if you are involved online to any extent, you need to make sure that there is some concrete provision made for the disposition of the online files in the event of your death. If necessary, it is a good idea to consult with an attorney or other competent advisor. Here are some of the videos from RootTech 2015. You can find more on the FamilySearch Channel on YouTube.com. Is Professional Genealogy a Growth Profession?